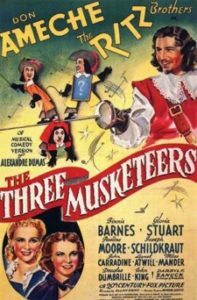 This is the first filmed musical version of The Three Musketeers (there are others! ): it’s a musical comedy swashbuckler, believe it or not. So, the first question is, is it any good as a musical? Well, Don Ameche, who plays d’Artagnan, can certainly sing—you have to give him credit for that. But the songs aren’t particularly worth singing, and they don’t really add much. As a musical, then, it’s pretty much a bust. How is it as a comedy? In that regard it’s mainly a vehicle for the Ritz Brothers, a comic trio briefly popular in the 1930s; some compare them to the Marx Brothers, but that isn’t really apt, because each Marx had his own distinctive character, while the three Ritzes, like the crackers, are indistinguishable and interchangeable. Also, they’re not funny, which is kind of a liability in a comedy. So no joy there. Most importantly, then, how is it as a version of The Three Musketeers? Surprisingly, it’s one of the more faithful adaptations of Dumas’s novel, which is rather amazing since, if they were already jamming songs and the goofball Ritz Brothers into the story, why did they bother? At a guess, it’s because the original story is so sturdy and resilient it can support the insertion of Ritzes and songses and still carry on just fine. Ameche is too old for the part of the young Gascon, but he’s energetic and far from the worst d’Artagnan ever cast—and the beguiling Binnie Barnes is one of the best-ever-cast Milady de Winters. She kills. Bonus: watch for the fun early appearance by John Carradine as Naveau (i.e., Bonacieux), Constance’s treacherous guardian.